Tsurumi Pump’s Bill Davidson recently visited Australia for the second time in two years to work with Australian Pump Industries . During his visit Davidson chaired a number of forums for business leaders in the mining, quarrying and concrete industry. He also undertook training for Aussie Pumps’ growing Tsurumi distribution network. 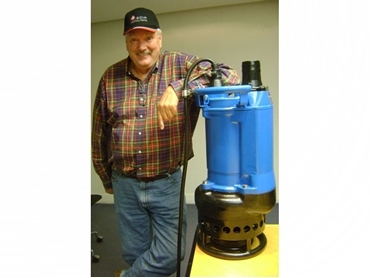 A man with 30 years of submersible pump experience, Davidson is responsible for putting Tsurumi in a prominent position in North America’s mining, construction and rental pump markets with the development of better products that are broader in scope and feature genuine engineering advantages to provide longevity and reliability to the user. One of the world’s biggest manufacturers of submersible pumps, Tsurumi Pump is based in Osaka, Japan. Their Kyoto robotised plant has the capacity to build one million pumps a year. Australian Pump was appointed by Tsurumi as their exclusive distributor for Australia and Papua New Guinea around 2½ years ago. According to Aussie Pump’s product manager Craig Bridgement, the company slashed prices by 40% across the board to make these world leading products more competitively priced. Aussie Pump was able to do this by committing to significantly larger volumes than the previous distributor, with the cost savings generated by bulk buying and reduced freight rate helping to lower prices. The Tsurumi product range includes three phase pumps developed specifically for the North American mining market where cost of ownership is a key factor. Davidson considers the LH series of three-phase deep well dewatering pumps as the backbone of the product range thanks to their great performance as well as the slimline design that allows the pump to fit into tight spaces. The product range includes big submersible pumps that offer up to 250m head capacity and flows of up to 300,000 LPM. Tsurumi submersible pumps incorporate a number of features that enhance the life expectancy and cut maintenance cost, including a unique anti-wicking cable gland that makes it virtually impossible for water to enter the motor through the cable as well as a double silicon carbide mechanical seal arrangement where both seal surfaces are submerged in oil, well away from the pump liquid. Davidson explains that these two simple features virtually knock out the two biggest single failure points on any submersible pump. Tsurumi also manufactures cutter, grinder and sewage pumps as well as submersible aeration equipment featuring simple installation and lower operating expenses. Australian Pump offers a full range of training courses in the use and application of Tsurumi submersible pumps. Courses can be delivered by local distributors or by attending the regular seminars held at Aussie Pump’s headquarters in Sydney’s Norwest business district. Tsurumi Pump sees Australia as key to expansion in the South Pacific markets. Tsurumi next plans to introduce state-of-the-art 1,000V dewatering pumps and explosion-proof pumps for Australia’s underground coal mining market.